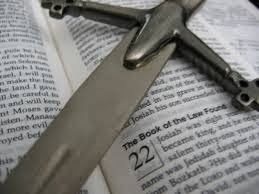 REFLECT: How did Paul feel bound by "another law in his members?" RESPOND: List your 5 greatest strengths. Then, describe how these "strengths" are powerless in the battle of overcoming temptation without the true power of the Spirit. Romans 8: 15-17 "For you did not receive a spirit that makes you a slave again to fear, but you received the Spirit of sonship... The spirit himself testifies that we are God's children. Now if we are children, then we are heirs --- heirs of God and co-heirs with Christ, IF INDEED WE SHARE IN HIS SUFFERINGS IN ORDER THAT WE MAY ALSO SHARE IN HIS GLORY." If we choose to be followers of Christ in this world, we musrt expect to encounter many trials and tribulations. A lifetime of temptations. The devil is constantly at work, and that is why we need to be prepared. But I have hope in knowing that if Jesus overcame sin and death, so can we. He came down to save us. He is the reason we are no longer slaves to our sinful nature. Maybe I am overthinking the question posed because I am struggling to answer what my actual strengths are.. I hope I am not answering this question incorrectly, but I believe my 5 greatest strengths in overcoming temptation are (1) in knowing the Truth [John 3:16], and that I am not of this world; (2) faith that God will lift me up from my struggle; (3) the ability to love others without an agenda (when I am being tested by others); (4) self-control (through continuous prayer for strength) and (5) the ability to think before I speak. I am also thankful for my close group of brothers and sisters who I can turn to in keeping me accountable when I am struggling with something. We are a community -- one body -- so that we don't ever have to go through any struggle alone [Matthew 18:20]. Sorry for the tangent.. just sharing my thoughts. Forgive my confusion, I'm new to this! Wow ... tough one today Coach, although it looks easy as it was written :) I seek power through the gifts of the Holy Spirit, yet cave to sin often when my mind is "in the flesh". The gifts are always there for me, as well as reconciliation and redemption, however it is by my sinful nature that I fail to "abide in the Spirit" and use these gifts. 1. Dedicated Father - Powerless when self righteousness and anger take over. 2. Dedicated Husband - Powerless by impure thoughts and by failure to love my wife as Christ loved the church. 3. Trustworthy - Powerless by allowing or rationalizing away small indiscretions. 4. Thoughtful - Powerless when selfishness wins out. 5. Encouraging - Powerless when I pick favorites. 1. I am dedicated, driven and passionate when I care about something. This 'strength' can only hold out against temptation for so long, eventually I will break down. 2. Love for others. Without the true power of the Spirit I can only love those who are 'easy to love' and I will fall into the temptation of being unloving towards those who are difficult to love. 3. Loyal, but I could be tempted to be loyal to the wrong people or causes without God. 4. I am sensitive and compassionate. But this strength is powerless if I am sensitive to some things but become cold and push away the people who really need my help. 5. Dependable, without the power of the Spirit I could fail and disappoint people trust and rely on me.